When was the most influential time in your life? Who were the most influential people? My college years stick out as a very influential time in my life. I was studying to be a teacher, had two mentors to guide me while I was away from home for the first time, started dating my future wife, and had many opportunities to volunteer in the community. This week, while thinking back on that time, I recalled a backpack literacy program I implemented with a group of K-5 students I saw weekly for after school tutoring. The children loved when it was their turn to take the backpacks home! (Click here to download all the backpack activity sheets). I pulled out the materials from the program and was astonished to see what I wrote over 15 years ago in a letter that went home with the backpacks each week, "Dear Families, This reading program was designed to give you and your child an opportunity to share in the reading experience. 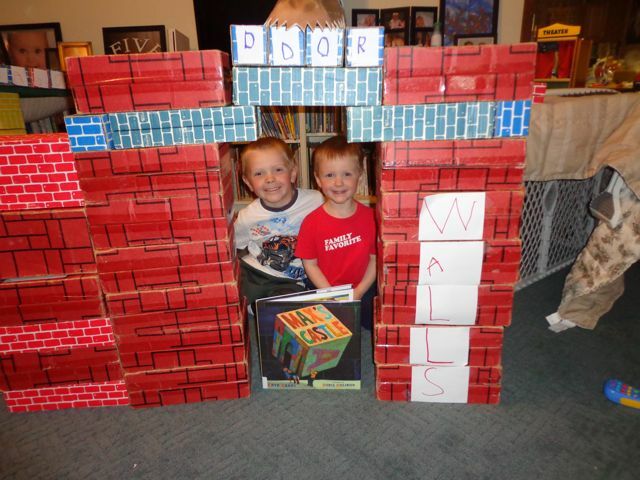 Reading becomes an exciting experience with the backpack reading program. Each backpack includes many books, suggested activities to bring the books to life, journals to write in, and other things that are tied to the story." The words "reading experience" have been the basis of all my work for this blog for the past three years. I guess working with those children had more of an influence on my life than I previously thought. Boris Kulikov said, "My theatrical background played a major role in my career as an illustrator. To me working on a book is similar to working on a play or shooting a movie. The difference is that I'm a director, artist and actor all in one, working with two dimensions instead of three." (Brooklyn Public Library). He has illustrated of over 20 books for children including the Giants of Science series by Kathleen Krull and The Castle on Hester Street by Linda Heller, a Sydney Taylor Honor Book (2008). He was born in Russia and grew up in a very artistic family. His parents were costume and set designers for theatre productions. He graduated from the Institute of Theatre, Music and Cinema in St. Petersburg. Boris sites his work as an editorial illustrator at the New York Times Book Review (click here to see an example of his work) as a time when he was introduced to very influential people in his career. 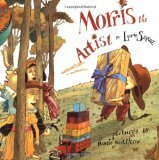 Steven Heller, the Art Director at the New York Times Book Review, introduced him to Frances Foster, who soon assigned him his first published picture book, Morris the Artist by Lore Segal. (Mazza Museum Keynote 2012, Publisher's Weekly, and The Boy Who Cried Wolf Weston Woods DVD). 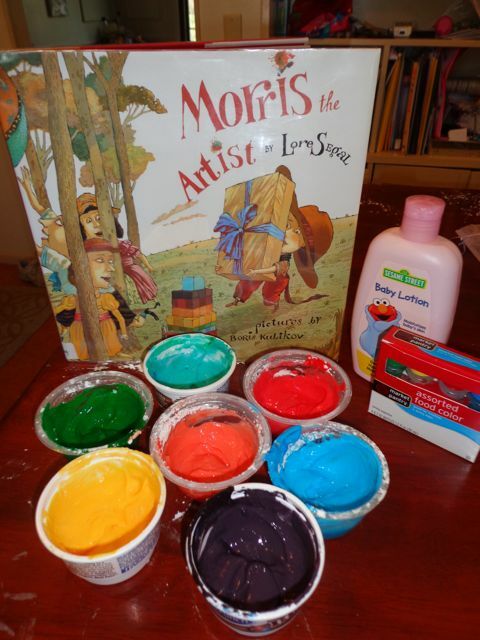 Morris the Artist was one of our favorite books of the week. Morris wants to paint and is not particularly excited about going to Benjamin's birthday party until his mother allows him to give paints as a gift. At the birthday party, Morris chooses to hold on to the gift instead of give it to Benjamin. The rest of the children are having a great time and Morris feels left out. Morris decides it is time for gift to be opened, but Benjamin is too busy playing with the other children. Therefore, Morris opens up the gift himself and begins to paint just like he wanted to do all along. Initially, the other children find the paints to be a silly gift, but Morris shows them how much fun they can be. Morris and the other children at the party have so much fun with the paints including painting each other! 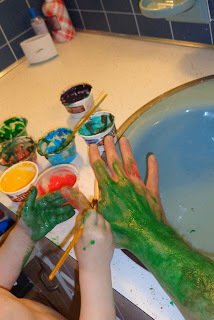 I found a recipe idea for homemade face paint from Growing a Jeweled Rose with three simple ingredients -- corn starch, baby lotion, and food coloring. We put 2 teaspoons of corn starch in each plastic container and then added a few squirts of baby lotion. We added baby lotion until the mixture was smooth. Then, we added food coloring until we were happy with the color. My older two children passed on this activity, but my youngest son could not wait to get started. He went right in with his hands trying all the colors. I didn't know how this was going to go so we did this activity in the bathroom. (I wish we could have been outside, but it was cold and rainy!). He insisted on painting me! He gave me a "zombie arm"! I am sure you are wondering if we stayed green most of the day....and the answer is YES. The homemade body paint dyed our skin. 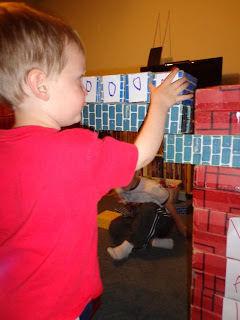 I washed up my son with soap after the project, did our daily cleaning throughout the day, and by the time he went to bed it was no longer noticeable on his skin. This activity was SUPER FUN, but I would NOT recommend doing it right before an important family photo! 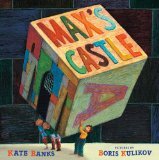 We had read Max's Castle by Kate Banks numerous times even before celebrating Boris Kulikov's birthday. (We loved having an excuse to read the book again!) During his keynote at the Mazza Museum Summer Conference 2012, Boris Kulikov described the book as his "most difficult project". He worked closely with Kate Banks on the book and coincidentally they both have sons named Max! 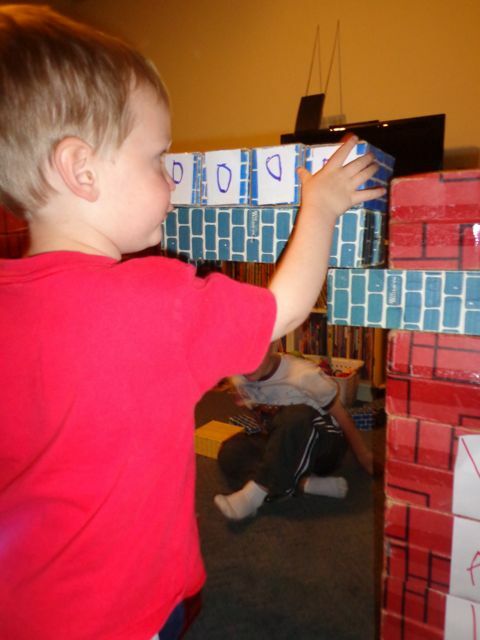 In this story, Max's brothers challenge him that he is too old to play with blocks. 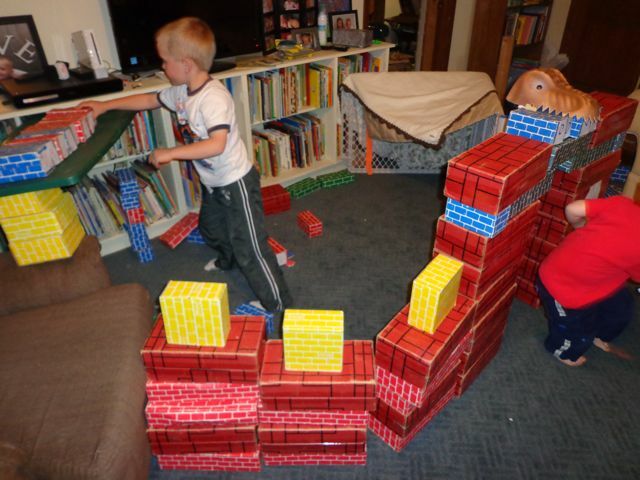 However, Max immediately shows them that blocks are fun regardless of how old you are by building a castle. The letter blocks, clever word-play, and Max's imagination help unfold a dramatic adventure where the boys choose a king, encounter pirates, and open a chest that holds a frightening surprise. My children know this story very well and were very excited when I suggested that we make our own Max's Castle. Before I finished hauling all the cardboard blocks into the basement, my son had decided that he needed to start with the WALLS just like Max. 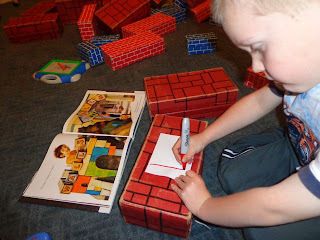 I gave him small pieces of white paper, tape, and a marker to create his letter blocks. 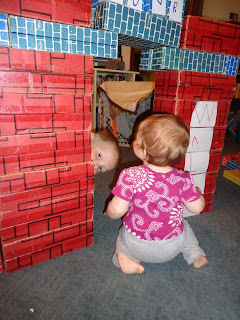 My youngest son added the letters D-O-O-R above the doorway to the castle. My youngest daughter loved crawling through the DOOR. 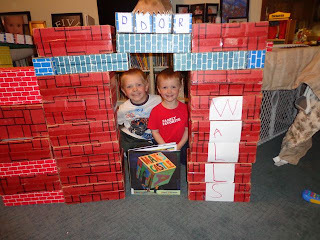 In the book, Max builds rooms for his brothers. 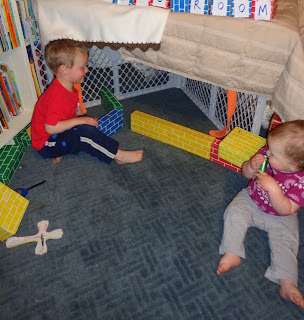 My boys each made a room for themselves within their castle too. 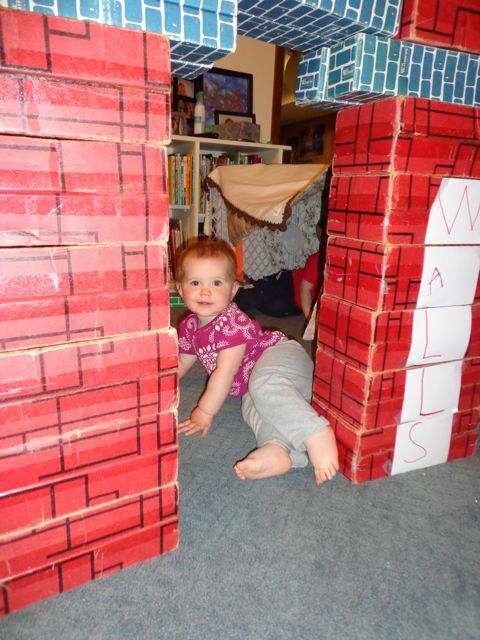 Yes she is cute, but she frustrated her brothers by knocking down their WALLS a few times! Eventually, we called her the D-R-A-G-O-N! 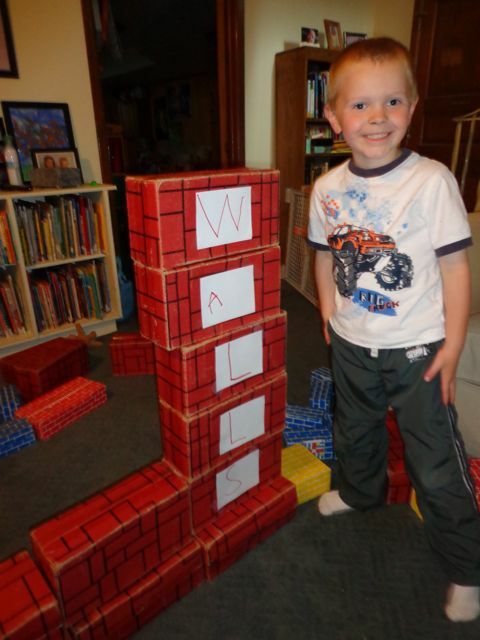 His room was almost complete! 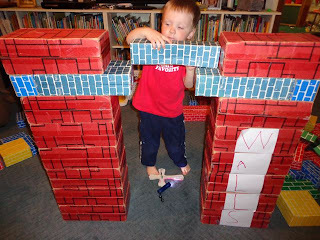 Bringing Max's Castle to life was the perfect way to spend a cold, rainy morning and share a "reading experience" together! Boris, we hope you have a wonderful birthday! We can't wait to read your new books!